This Shampoo has 0% parabens and colourants. 90% Natural origin ingredients* (*purified water and natural-source ingredient materials with limited processing). Herbal Essences bio:renew is crafted with a blend of essential antioxidant, aloe and sea kelp. Argan Oil of Morocco Shampoo helps restore hair smoothness. This Shampoo is pH balanced and safe for colour treated hair. Herbal Essences bio:renew brings your hair back to life. 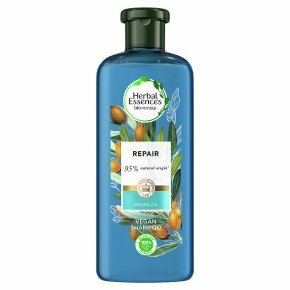 Herbal Essences bio:renew Argan Oil of Morocco Shampoo and Conditioner help bring hair back to life. They?re crafted with a signature blend of essential antioxidant, aloe and sea kelp. Herbal Essences bio:renew helps purify & protect against what your hair gets used to over time. The result? Soft, free-flowing hair. Your hair will get soft and free-flowing because Herbal Essences bio:renew formula continues to work with each wash. Plus, you'll notice your hair shining, smooth and free from frizz. From the first pop of the cap, Argan Oil of Morocco Shampoo will take you on a multi-layered scent experience to the warm sands of Morocco. Immerse yourself in the scent of creamy vanilla followed by a burst of fizzy citrus and lingering exotic spices. Simply apply shampoo to wet hair, massage into a creamy lather, enjoy the scent, and rinse. Made with at least 90% natural origin ingredients*, pH Balanced and safe for colour treated hair. * Purified water and natural-source ingredient materials with limited processing. Simply apply shampoo generously to wet hair, massage into a creamy lather, enjoy the scent, and rinse. For more beautiful hair, use with Herbal Essences bio:renew Argan Oil of Morocco Conditioner.